One thing that I actually really enjoy around the holidays is menu planning. Anyone else? Maybe I'm just nuts... The hubs and I are hosting Christmas Morning this year, and I have to keep reminding myself that 1) there are only 5 of us this year 2) it's only breakfast and 3) I am 38 weeks pregnant. I want to make it ALL!! From something sweet to something savory, a fancy coffee drink for the slow-cooker to recipes that I can make ahead of time - I am having the hardest time narrowing down my menu. Seeing that Christmas is in 48 hours, I finally decided on (for now) a bagel and croissant bar (with whipped honey butter and chia jam), fluffy eggnog cinnamon rolls with (diary free - for my dad) cream cheese frosting, and a big ol' fresh fruit platter to go with some yogurt/granola parfaits. Too much? Never!! LOL. 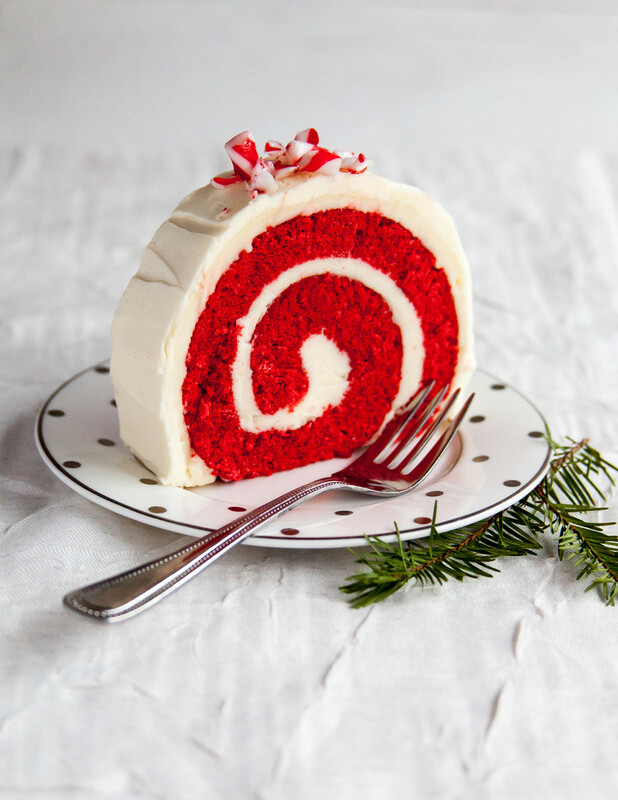 As I head out to fight the crowds at Whole Foods (hoping that people will make way for my big preggo belly), feast your eyes on this: a glorious Peppermint Red Velvet Cake Roll! For all of you that are still menu-planning, add this to your list. I looks super fancy and festive, but actually really easy to make. I've paired a traditional Red Velvet Cake Roll with White Chocolate Peppermint buttercream. And before I start receiving hate mail, no - you don't need to use red food colouring if you don't want to. However, it only takes a little bit to get this red - trust me, I was almost completely out of gel food colouring and just scraped the bottom of the tube with a toothpick to add to the batter. Feel free to leave it out completely - I promise it will still taste delish. Head on over to The Kitchn for the full recipe. Happy Holidays to all!!! And if you don't hear from me for a while, then it probably means Baby Huff decided to come early. I can't wait for you all to meet him! 15 hour drive to California with lots of snacks and fast food, eek! Continuous holiday celebrations with family and friends. Finally check out my collegue's restaurant downtown, including cocktails, fresh-made bread, 3 courses, and sweet treats. Day trip to SF with the cousins and get in touch with our German roots while eating schnitzel and waffles. Discover Dandelion Chocolate, OMG. Cookie decorating with my nieces and nephew. Enjoy a cold beer before the kids actually get there. Cover cookies with gobs of frosting and way too many sprinkles. Frantically finish wrapping up my Red Wine and Rosemary Sea Salt that I made as gifts this year as the doorbell rings and family arrives. Make two-kids of focaccia to go with Grandpa's Chili for Christmas Eve. Double Christmas at my in-laws' and my parents' homes. Christmas margaritas. Eat two celebratory dinners, plus Gingersnap Ganche Tart with Coffee Whipped Cream (recipe coming soon). Squeeze in a volleyball game with my cousin and her BF from San Diego. Get bruises from not having played volleyball in 15 years. Christmas Round 3 - BBQing during an unusually sunny California December. Second round of Cranberry Cream Cheese Dip. Adult cookie decorating- cue more sprinkles and too many cocktails. Sure made for a funny and fantastic game night though! Attempt to clear out mom's fridge before returning to Canada by making TONS of kale chips and juicing everything is sight. 15 hours drive back to Canada- decide to balance out fast food with the left-over kale chips. Feel a tiny bit better about previous week's diet, and allow a few too many finger-foods on NYE. Happy 2014! Vow to eat clean and exercise in the new year. ..... browse our pantry after being gone for weeks. Find some leftover candy canes, round up the half-open bags of chocolate chips and leftover blocks of chocolate I always have in my kitchen, think about purging the pantry of all processed food, decide to make Peppermint Rocky Road with the last half of a bag of mini marshmallows.